The Dyepot Weekly Kickstarter Campaign smashed my expecations, and smashed all of the stretch goals I came up with out of the park. One of these stretch goals was that every backer who selected a shipped reward would receive a mini skein of hand dyed yarn. Depending on the selected reward, the bonus mini-skein would be handspun or dyed on a commercial yarn. I did not label the individual mini skeins of yarn. Instead, I thought it would be fun to write up a summary of all of these yarns, and to see if I could figure out exactly what video or blog post they came from. Are you ready for this trip down memory lane? I dyed the fiber for the first two skeins on the left in a livestream this past September. I handpainted 200 g of 100% wool roving with Kool-Aid. This was the first time I did a dyeing livestream, and it was so much fun to interact with everyone while I was dyeing the fiber. I also got a great tip, put the fiber though a salad spinner to help it dry. This tip was LIFE CHANGING. I think I might buy a salad spinner to use with non-food safe dyes. In the first yarn, I N-plyed (chain plyed) the yarn in another livestream. I don't think I wrote down the WPI (wraps per inch) for this yarn, but I got a minimum of 57 yards out of this yarn. The fiber in the second mini skein of handspun yarn was dyed in the same video as the previous one. I spun Z singles, wound the singles into a center pull ball and then made an S 2-ply yarn with both ends of the yarn cake. I didn't film any of the plying for this yarn. The fiber from the middle two skeins is some unknown 100% wool fiber that I dyed in the original breaking black food coloring video. I've come a long way since some of these early dyeing videos! I spun the fiber recently with mini-skeins in mind. I spun uneven Z singles, wound them into a center pull ball, and then plyed both ends in the S direction. Skein #3 came from breaking Wilton's Black (the old formulation). This fiber was dyed and spun in the same ways as #3. The only difference is that I broke McCormick's black food coloring to dye this fiber. The breaking is super subtle in this fiber, but you can see the blues peak out in some places. This yarn is a very special yarn to me. I space dyed this roving with food coloring I had mixed in a previous video. With this roving, I attempted to spin my first chunky yarn. The yarn was bulky, but not as chunky as I had hoped. What is super special about this yarn? I used this yarn to knit a baby cuccoon to use in my son's newborn photoshoot. I spun a chunkier yarn that I was going to use for the body of the pod, and I knew that I didn't quite have enough yardage. I used this to cast on the top edge and then used it to finish the bottom when I ran out of the other yarn. The sunset colored yarn on the far right was the first yarn I spun when I was planning the hand dyed and handspun miniskeins reward. To get these bright colors, I space dyed braided roving with Easter egg dyeing tablets. Like many of the ther yarns, I didn't think too much about plying until I was already spinning the singles. I wound the singles into a center pull ball and plied the yarn in the S direction. I ended up with about 67 yards of this yarn. I recently discovered that when I make a 4 foot skein on my niddy noddy that it is actually a bit longer than 4 ft. Therefore, all of my yardage estimates, which I calculate by counting the wraps and multiplying by 4/3, understimate the yardage I got while spinning. These hand dyed miniskeins came from all over. Some came from dyed blanks, some are remnants from projects I was knitting, and others are full miniskeins that were featured in a dyeing video. Some of these yarns came from 100 g skeins of yarn that I had in my stash. I will tell you more about all of the yarns below. 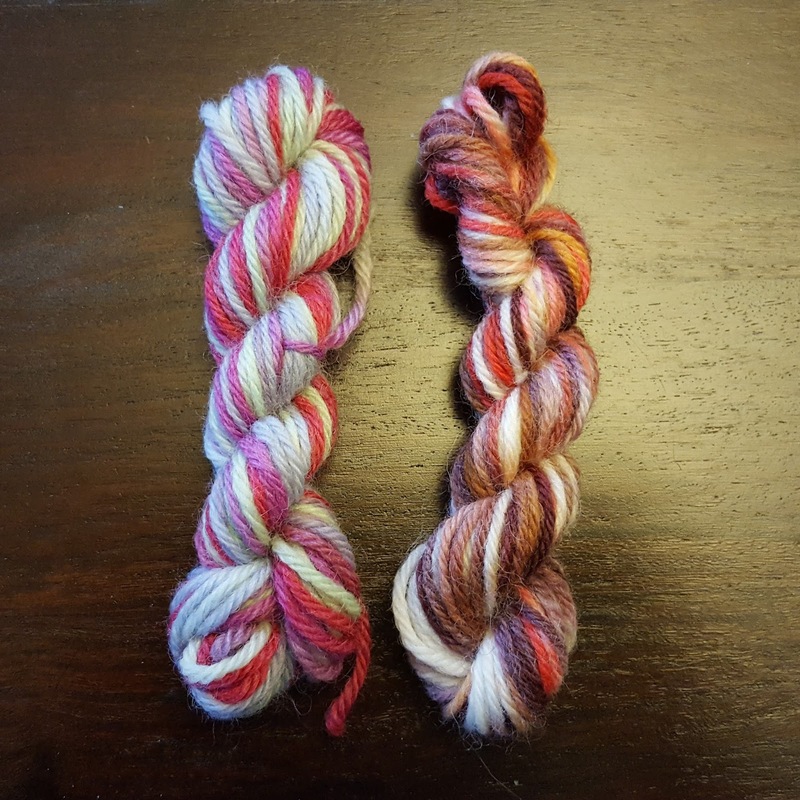 Left: In 2012, I created the video "How to Dye Cotton Yarn with a Tulip Tie Dye kit". Two 50 g balls of sport weight cotton yarn in this video. I used Simply Cotton organic sport weight (KnitPicks Affiliate Link) These four yarns are some of the ones that came out of the complete ball of yarn that I dyed. Notice how the colors change based on whether they were on the outside of the ball (far left) or the inside (the greener yarns on the right.) The video also features some of my favorite tie dyed t-shirts that I made in college. Bottom Right: I showed three mini skeins here to show how much more consistant this colorways is, especially compared to the two other dyeing projects in this picture. 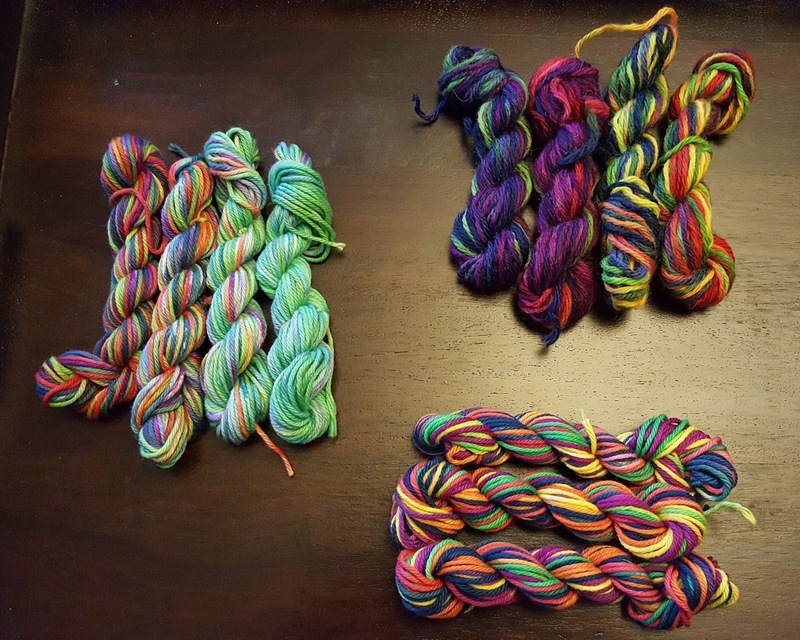 I wound the 50 g ball of the sport weight cotton yarn into a skein and then handpainted that with all of the colors in the kit. The colors came out super vibrant and then yarn is a lot of fun. You can see the dyeing in the same video linked above. Top Right: In this video, I wraped up a pre-knit blank (that I hand knit, by the way) and then tie dyed this hand knit fabric into a spiral. The yarn base is 100% wool, Bare wool of the Andes worsted weight yarn (KnitPicks affiliate link). I now have a hand crank knitting machine that I use to make my own blanks. It takes much to long to knit them by hand! 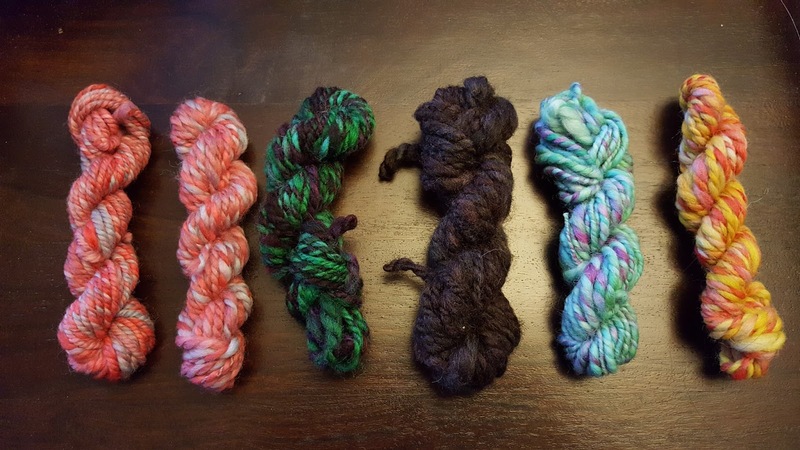 These 4 miniskeins look super different from one another, but they all came out of one dyeing project. This is a VERY special yarn, an I knew that I wanted to send out some miniskeins of this yarn to Kickstarter backers. This is the first 100% wool yarn I ever dyed. Ever. I only had this blog, I didn't even have a YouTube channel yet! I used a mixture of Kool-Aid and liquid food coloring to dye 100 g of bare KnitPicks palette yarn (Affiliate Link) in the microwave. 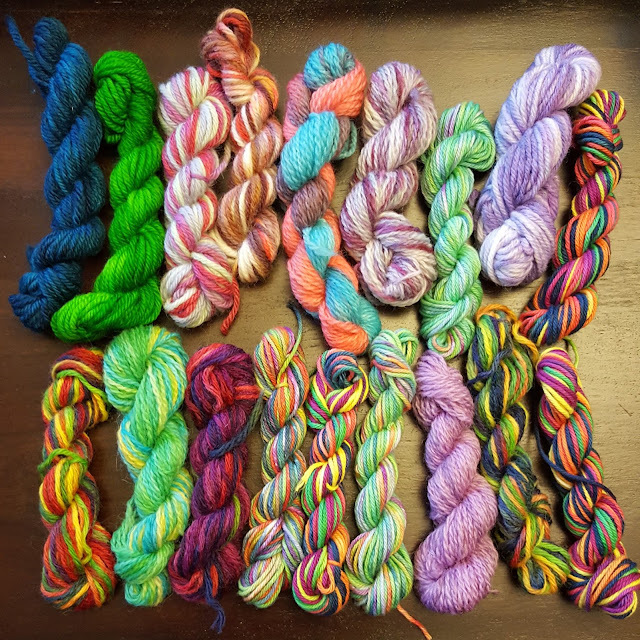 I've used this yarn to make multiple different projects, some of which are featured in the FAQ video of finished knit projects made with hand dyed yarns. I used this yarn to make a hat, a pair of mittens, and then later in the video, a hexapuff. I wanted to dye this yarn because I loved the look of mixing variegated yarns with black, it sort of looks a little like stained glass. This hat is one of my favorites and I wear it frequently. Some of these yarns come from super old videos, like 4 addresses ago! This is the first time I ever explored breaking purple food coloring. I had successfully dyed some solid purple yarns previously and now I wanted to see what all of this breaking talk was about. The yarn base is KnitPicks bare palette yarn. This yarn was dyed using some food coloring I bought at the Christmas Tree Store (random brand) and then dipping portions of the skein into dye in the microwave. I would add 2/3 of the yarn at a time into a different bath of water. I haven't done this technique in a long time, and I'm not entirely sure why. I think that I need to do some dip dyeing in multiple colors soon! This purple yarn is STUNNING. The colors are spotty and mabled. How did I do this? 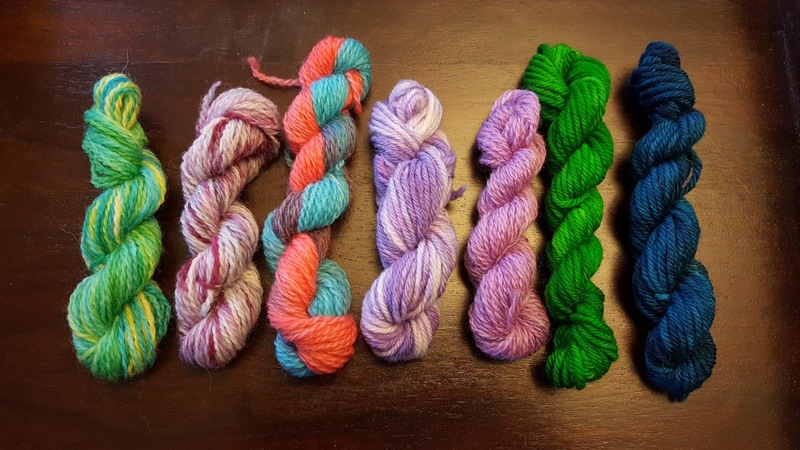 I dyed the yarn using some rice that had soaked up some food coloring. The technique (and video) are a lot of fun, but unfortunately it was a HUGE pain to remove rice from these yarns and to wash out all of the starch. I can't image doing this on 100 g of yarn! The yarn base is a mini skein of bare wool of the Andes worsted weight yarn (KnitPicks affiliate link). This yarn is a sublte, semi-solid purple. I loved it so much that I wanted to share how these subtle tonal changes can be super stunning with all of you. The yarn base is KnitPicks bare palette yarn. I used a Tulip Tie Dye kit and added the color to dry yarn. The tie dyeing instructions recommend using presoaked yarn, but suggested that it wasn't a requirement. I was curious how the colors would bind to the yarn if I just randomly squirted it on. I think that I eventually needed to add some more water because the dye sort of beaded up on the surface, but this was a really fun experiment. & 7. The last to yarns on the right were dyed as miniskeins with a very specific project. I needed to color match some yarns I used in Lucky's first birthday outfit AND I wanted to try dyeing yarn in mason jars on the stove top, sort of like a double boiler. I should have put a towel under the jars! Whoops. These colors ended up not being close enough to what I needed, but they are so pretty! The yarn base is 100% wool worsted weight wool of the Andes yarn. You will even see some pictures of Rowdy in his birthday outfit with some of the dinosaurs I crocheted out of the yarns I kept from this video. The last two yarns were dyed recently, and only one was dyed by me. The left yarn was dyed using some old (like, months-years old) tulip tie dye that had been sitting in squeeze bottles for a very long time. This video will come out on November 24, 2017. The final yarn (on the right) was dyed by Lucky! Lucky dyed this yarn while I worked on a rainbow colorway. Lucky wants to keep all of his yarns, and I turned almost all of this yarn into a brand new hat for him. There were 10-12 g of yarn left over after I finished the pompom, so I knew that I needed to share these with two backers. Both of these yarns are 100% worsted weight wool. I hope that you love your bonus mini-skeins! I will need to wind a few more for some of the next shipment rounds. Actually, I have a lot more dyeing to do before the next shipping round. Wahoo! Got my package today! So happy with the skein I received (space dyed with Easter egg pellets..orange, yellow and red). Can't wait to put it to use! Thanks, Rebecca.